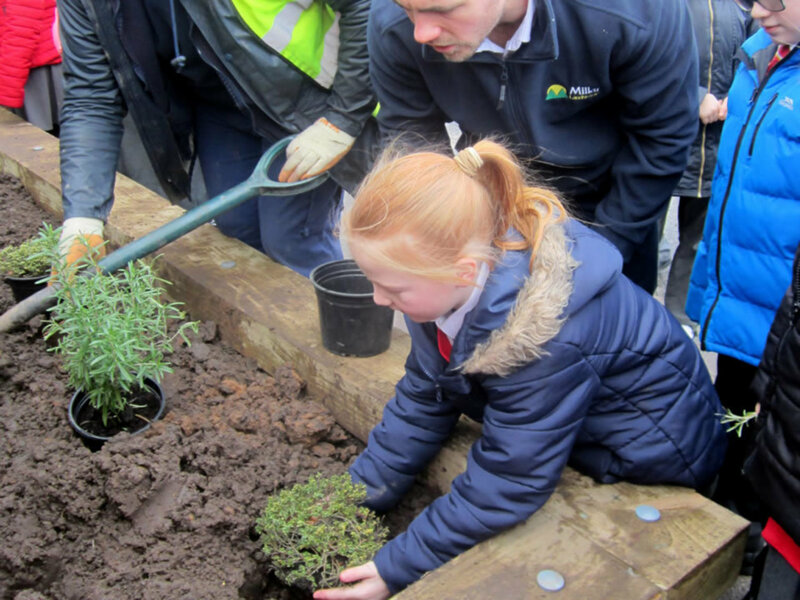 This is a case study to show how a workshop around building a planter outside the school's main office had a positive impact on the curriculum. The aim of the project was to give the children an input into their school development and to show them what is involved in different work roles. The demonstration took place on 29th January 2016. The children were primarily a class from Year 4 and were later joined by others from Year 5 & 6 when we started planting. We took the children outside to where the planters were being built. Once we arrived a Hiab wagon (a lorry with its own crane) came into the school and was carrying bags of soil to fill the planters. We talked to the children about the weights of the bags being 1 tonne and how that was equivalent to 1,000kg. We then discussed how much they thought the lorry weighed and how much it could carry, some children guessed 10 tonnes. After asking the driver he told us it weighed 7.5 tonnes and could carry a load of 6 tonnes. This part of the workshop was all focused on maths. We also talked to the children about the job of the man controlling the crane arm and what he was using to control it. We then took the children over to a bench saw that we had set up for the demonstration. We explained all the safety equipment such as protective glasses and ear defenders then showed the children set squares and angle finders and asked the children to identify the different angles, which directly linked to their maths lesson planed for the next day. The children had previously looked at weights such as grams, kilograms and tonnes in their lessons but had no idea of what these weights looked like. Mrs Freer stated that the children ‘don’t have any concept of what a tonne looks like so this gave them a physical and visual connection which strengthened learning’. Another positive outcome was looking at angles, as the children’s next maths lesson was to be focused on angles. The children all remembered the angles that we had talked about and had shown them. Mrs Freer said ‘we talked about the angles from a practical point of view which strengthened learning as the children had something to link back to’. We were also able to introduce the children to the jobs of a joiner or carpenter who would use angle finders and squares and why they need to learn them which helps build for the future. The children got an important learning opportunity which they loved. Now whenever the children see the planter, they will have a reminder of what they learned that day. We are currently designing the EYFS area for the school and will be constructing a mud kitchen for them as the first phase of the work. Again, this will involve the children and will create more opportunities to bring life to the curriculum and the different roles involved in peoples jobs. We intend to undertake a series of workshops for the children linked to the EYFS grounds projects helping to support teaching and learning in new and exciting ways. Where it is not possible to directly involve the children, we intend to present additional demonstrations enabling the children to get involved by making mini models of some of the project items. We would like to extend our special thanks to Mrs Bramhall, the Head at Sacred Heart Primary School, for her support and forward thinking by enabling us to demonstrate new and exciting ways to use school grounds to encourage teaching and learning in a variety of ways. We are delighted at the number of positive outcomes and hope that by sharing this case study, other Primary schools will be inspired to try new approaches.